Selecting a pesticide which allows application through a center-Pivot irrigation system is the first and most critical consideration in making a decision to chemigate. However, additional factors should be considered. Pivot irrigation system location. Location of a Pivot system in proximity to occupied buildings or dwellings, surface water sources, neighboring crops and roadways must be carefully considered. Persons, wild and domestic animal life and other nontarget sites must not be endangered. Some countries may have established minimum distances between chemigation sites and certain structures; regulations may prohibit chemigation if the application site is immediately adjacent to a residential area. Restrictions also may apply if wells used for chemigation are in close proximity to municipal water supply wells. Soil type. Soils can differ considerably over relatively short distances. Therefore, it’s not uncommon to find different types of soils within a single field. The rate at which water and/or agricultural chemicals enter the soil (infiltration rate) differs according to soil type. It follows that variations in soil type will influence irrigation system management and chemigation operations. For example, coarse-textured sandy soils have high infiltration rates. Assuming that other factors are equal (slope, compaction…) there is less potential for runoff on coarse-textured soils than on fine-textured soils. On the other hand, chemigating with excessive amounts of irrigation water could result in leaching the chemicals below the crop root zone. Where fine-textured soils (those with high clay content) are to be chemigated, the situation is reversed. The potential for deep percolation of water/chemicals is decreased, but the potential for runoff increases. Topography. Topography of the field can substantially affect uniformity of application through center Pivots lacking properly regulated sprinklers. Variations in terrain along the length of the machine will cause differences in pressure at various nozzle outlets. This results in uneven water distribution, that can be corrected by using pressure regulators on each individual sprinkler. Pivot irrigation system characteristics. Physical characteristics of the Pivot system can affect the capacity for applying agricultural chemicals. Center Pivot sprinkler irrigation systems can be used to apply fertilizers or pesticides that must be incorporated into soil, when foliar application is needed. Any machine used to chemigate must have the appropriate injection equipment and anti-pollution safety devices installed, and the entire system must be in good working order. Drift and runoff potential. Drift and runoff are two leading causes of inadvertent losses from chemical applications. Environmental conditions during application, type of sprinklers installed on center Pivots, type and formulation of chemical being applied, and climatic conditions following irrigation are factors affecting magnitude of chemical losses. Drift. When water emerges as spray from a sprinkler nozzle, part of it may evaporate within the wetted area. Part is intercepted by vegetation and/or soil and part may be carried by wind outside the treated area. A producer is responsible for monitoring the weather when chemigating. If the wind is strong enough to cause any off-target application, the system should be shut down. Runoff. 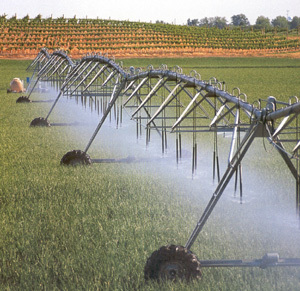 It can potentially occur whenever the Pivot irrigation system is applying water at a rate greater than the soil intake rate (the rate at which water enters the soil). Runoff is influenced by: the field slope, soil surface roughness, and the presence of a crop canopy or residue. Chemigation runoff is a potential hazard to ground and surface water supplies, livestock, adjacent crops and wildlife. The amount of water being used to apply the chemicals may need to be adjusted to prevent runoff. Calibration. Accurate calibration of the application system is critical. Unless the system is calibrated, there is no way to determine whether the amount of chemical applied is too much, too little or just right. Overapplication is needlessly expensive, and the producer could be prosecuted for misuse of a pesticide. Underapplication frequently does not provide the effect needed.